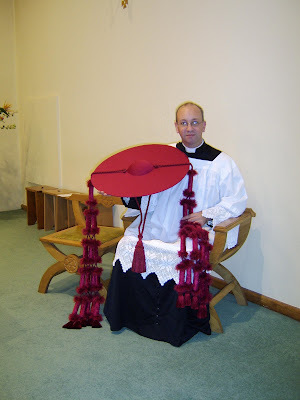 H/T to Roman Christendom for this picture of the galero or cardinal's hat, held by the parish priest of Warminster, Fr Bede Rowe, who made it. It was placed on the catafalque at Saturday's Requiem. Perhaps Fr Rowe should start a business providing hats to be suspended above the tombs of cardinals. The old tradition is that when the hat finally falls down, it is a sign that the cardinal's soul has been released from purgatory - in which case, most of the deceased Cardinal Archbishops of Westminster still need our prayers! Many thanks, Father, for posting the photo. It occurs to me that Father Bede must be the only priest in England to have the red hat ! That is a most interesting theory about the eventual disentegration of the galero suspended above a cardinal' tomb. I think we were taught in the old days that, because the cardinal had been "crowned" with the galero by the Pope, its final disentegration was a sort of reminder "sic transit gloria mundi". But the theory that its disentegration marks the release of the cardinal's soul from Purgatory is a most fascinating one. I shall be keeping a more careful eye on the state of preservation of deceased cardinals' galeri in future ! As an former parishioner of Fr Bede, I can testify that this is not presumption on his part: he has an Extraordinary collection of headgear. Besides, wearing a galero would make driving a Morris Minor difficult! Cardinal Richelieu's galero still hangs over his tomb at the Sorbonne chapel. Unfortunately, his non-fans kept renewing the cord, supposedly as a way of extending his time in Purgatory. The suspending of cardinals' hats over their tombs is very interesting. The earliest one I have found is that of Cardinal Richlieu at the Sarbonne. I've been told of the same practice over various 'medieval' tombs in Spanish cathedrals (Seville where cardinals' hats are suspended high up in the vault?). This seems to be an 18th century commemoration as well - as far as I can find out. I've found one in Rome - in San Lorenzo in Damaso but from the 19th century. Does anyone know of any earlier 'hangings' of hats?